Our Bekoji Children’s Village in Ethiopia is continually growing with precious children in need of care and a family. 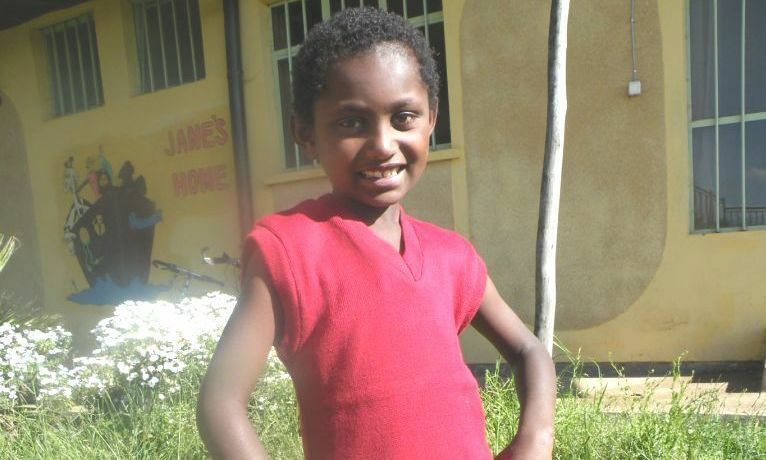 One of the most recent additions to the Stand by Me family in Jane’s Home is Hawani who has a sweet smile, caring attitude and is growing in confidence. Hawani’s mother died when Hawani was born and her father was left to look after her. Her father struggled to care for young Hawani as he has a disability; in desperation to feed his children he resorted to begging for food in a nearby town. With her father out begging all day and living in a small one roomed mud hut Hawani’s prospects were bleak. But she was enrolled onto our sponsorship programme and was provided a free education, nutritious meals and medical care at the Bethany School. But sadly things went downhill for Hawani as her father became more desperate, first making Hawani beg for money on the streets with him and them splitting up the family and sending Hawani to live with a different family far away from the Bethany School and work as their maid. The family were cruel. Unable to attend school, Hawani felt hopeless. Stand by Me heard of Hawani’s situation and wanted to give her a true home and family away from the clutches of child labour. We accepted her into Jane’s Home in the Bekoji Children’s Village where she is happily mixing with her new sisters and receiving quality care. Hawani is active, confident and inquisitive. She loves to play games with her friends and loves learning all her subjects at school but counting numbers is by far her favourite. Hawani celebrated her birthday at Jane’s Home this year and thoroughly enjoyed the experience. The celebration included food, songs, photographs, and speeches and all the children in the Bekoji Children’s Village celebrated with her. If you would like to give a child just like Hawani the chance of an education and freedom from child labour then read more about child sponsorship.